NEW YORK, May 09, 2013 (BUSINESS WIRE) — This 4th of July, the nation’s largest patriotic pyrotechnic display will illuminate the night sky over New York City as the 37th annual Macy’s 4th of July Fireworks(R) rumble to life. 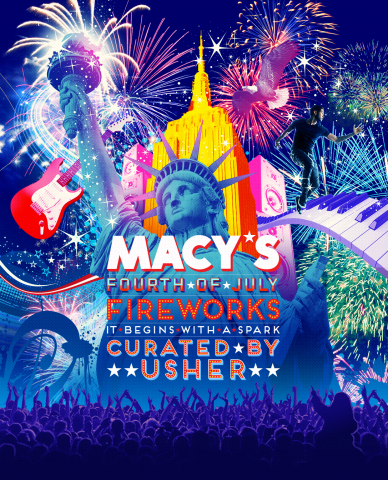 A spectacle like no other, this year’s show will feature a first-ever, one-of-a-kind collaboration with global superstar Usher, who has sold over 50 million records worldwide throughout his illustrious career and will join Macy’s in igniting sparks over the Hudson River . For the first time in the history of the show, a superstar artist is collaborating with Macy’s creative and pyrotechnic teams. Lending his artistic inspiration and talent, eight-time Grammy(R) Award-winning artist Usher is curating the overall design of the show, entitled “It Begins with A Spark.” From the rousing musical selections to the spectacular Fireworks in the sky, Usher is putting his visionary stamp on the nation’s biggest Independence Day party. Beginning with the score, Usher’s musical tastes are evident and reflect a melting pot of influences that span several decades of music. From current smash hits by artists like Rihanna, Kelly Clarkson, Avicii and Swedish House Mafia to classic artists like Jimi Hendrix, Frank Sinatra and Sam Cooke, the explosive evening will feature a taste of musical styles ranging from pop and soul to country and electronic dance music. With a selection of Usher’s top hits in the mix and Americana favorites such as “America the Beautiful,” “God Bless America” and “The Star-Spangled Banner” rounding out the presentation, the Fireworks will have a spectacular back beat as they paint the night sky. Usher’s artistry also extends to the canvas in the sky. 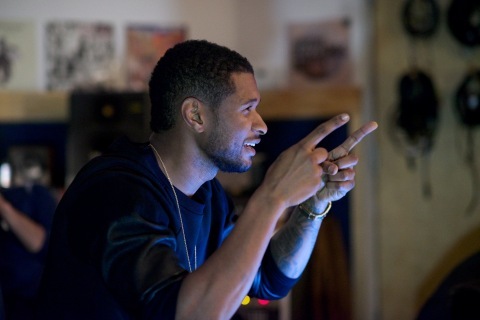 In collaboration with Macy’s Fireworks designers Gary and Jim Souza, Usher is providing visual design cues, inspiration and direction for the pyrotechnics that are choreographed to the score. Featuring never-before-seen effects, shapes and colors, the partnership is yielding a dazzling spectacle that will spark a wave of awe in audiences from coast-to-coast. The 37th annual Macy’s 4th of July Fireworks will fire more than 40,000 pyrotechnic shells during a 26-minute synchronized display. SOUSA Fireworks is once again at the helm of the pyrotechnics which will be positioned on the Hudson River approximately between 24th and 40th Streets. With an average of 1,800 shells launched per minute, Macy’s Fireworks show provides the biggest booms in the nation. Macy’s explosive spectacle is made possible in part by KitchenAid(R), Kool-Aid(R), Planters(R) and is presented in partnership with the City of New York. Revelers lining the Macy’s Fireworks viewing locations are encouraged to enjoy the full experience by tuning in to radio stations 1010 WINS-AM to hear the musical score to which the show is choreographed. Spectators from coast-to-coast will also have a front row view of the pyro in the sky by tuning to NBC’s national broadcast of “Macy’s 4th of July Fireworks Spectacular” beginning at 9 p.m. ET/PT, 8 p.m. CT/MT (check local listings). In addition to the pyrotechnics, the 4th of July’s most popular entertainment special will feature performances from the nation’s hottest musical acts. For more information on the 37th annual Macy’s 4th of July Fireworks, please visit www.macys.com/fireworks or call the Macy’s Fireworks Hotline at (212) 494-4495. Information will be available as of June 4, 2013. Macy’s 4th of July Fireworks are the nation’s largest 4th of July pyrotechnic display. Produced by Macy’s and designed in conjunction with SOUSA Fireworks of Rialto, CA, Macy’s Fireworks are a digitally-synchronized display of firepower that is choreographed to a rousing popular music and patriotic score. Annually fired from various locations across New York City, Macy’s Fireworks features shells from all over the world. Seen by more than 3 million spectators and millions of viewers nationwide, Macy’s 4th of July Fireworks have become the nation’s premiere 4th of July celebration event. For Macy’s media materials, please visit our online pressroom at www.macys.com/pressroom. Previous PostCalifornia Fireworks License Renewals Due TODAY!